MEASUREMENT = ON uses Iso.lin: Linetype definitions are expressed in mm. MEASUREMENT = OFF: Default.lin: Linetype definitions are expressed in inch. Nowe obiekty są tworzone z użyciem aktualnej szerokości linii. Obiekty które jako typ linii posiadają wartość JAKWARSTWA otrzymują typ linii jaki został przypisany do warstwy obiektu. Obiekty które posiadają opcję typu linii JAKBLOK są rysowane z użyciem linii ciągłej do momentu przypisania ich do bloku. 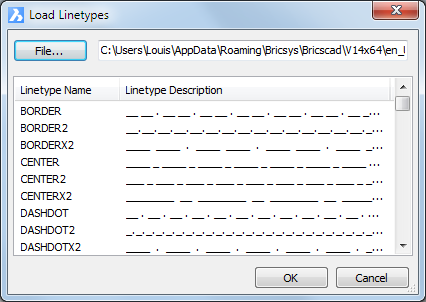 Non-continuous linetypes consist of lines, gaps and dots put together in a variety of patterns. In complex linetypes also text or shapes can be included. 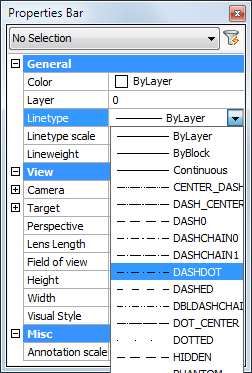 BricsCAD will always put a dash at the start and end of a line, polyline, arc or spline. The linetype pattern is also nicely centered, so that both ends of the entity look the same. Linetypes are normally generated from vertex to vertex. Polylines of which the vertices are very close together might be rendered as a continuous line, if the linetype pattern does not fit between two subsequent vertices. The Polyline Generation (PLINEGEN) system variable addresses this problem: when set to 1 or ON, the linetype is drawn from one end of the polyline to the other end, instead of from vertex to vertex. Ta sama polilini rysowana z włączoną (lewa) i wyłączona (prawa) zmienną PLINEGEN. PSLTSCALE controls linetype scaling in paperspace layouts. If ON, linetype scaling is independent from the viewport scale. In general, PSLTSCALE is best set ON. Remember that this variable can be set per layout. If MSLTSCALE is ON, the current annotation scale (CANNOSCALE) is applied to linetypes in model space. MSLTSCALE is best set OFF. It might be usefull to switch it ON when printing from model space. Wybierz Ustawienia z menu Ustawienia. Expand the Entity Creation settings sub-category. 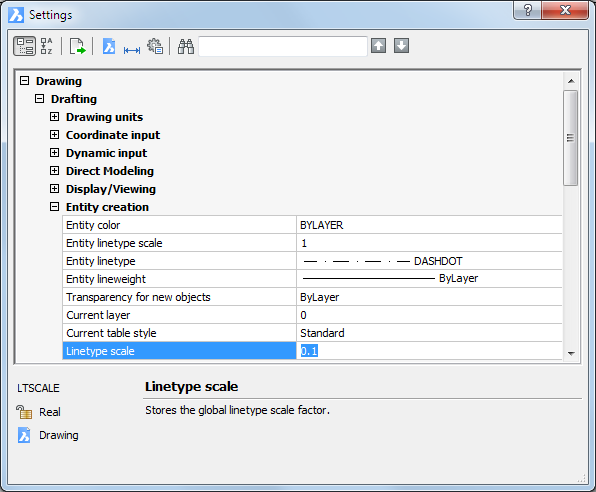 Select the Linetype Scale setting (LTSCALE). Type a new value in the Global Linetype Scale field, then press Enter. W Pasku Właściwości Bicscad wybierz Typ linii. Upewnij się, że nie jest zaznaczony żaden z obiektów. Wybierz typ linii z rozwijalnej listy. W pasku Właściwości obiektu kliknij na strzałkę w dół obok pola Typ linii, wybierz typ linii z rozwiniętej listy. (opcjonalnie) Kliknij prawy przycisk myszy w pole Typ linii Paska stanu, następnie wybierz typ linii z menu kontekstowego. The Drawing Explorer - Linetypes dialog displays. 2. Click the New tool button ( ) in the Details toolbar. 3. W Oknie Właściwości BricsCAD wybierz Skala Typu Linii. Upewnij się że nie zsotał zaznaczony żaden z obiektów. 4. Select a linetype, then click the OK button. 5. (option) Click the linetype name to rename the linetype. 6. (option) click the linetype description to edit the description of the linetype. The CELTSCALE system variable sets the value of the Linetype Scale property for new entities. This variable is best set to 1, except for special linetypes, such as BATTING or GAS_LINE, which most likely need to be scaled. 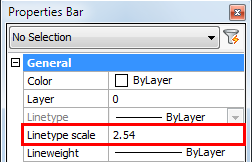 On the BricsCAD Properties Bar, select Linetype scale. Make sure, no entity is selected. Type a new value in the Linetype scale field.